Back in January, we spent a Friday morning at a place called Fagnoon. Fagnoon is a made-up word that, in Arabic, means something like “crazy art.” Fagnoon the place is an amazing art center, mostly for kids, but really for everyone. It’s colorful and inspiring, outside of the city, surrounded by fields, and staffed by some wonderful people. 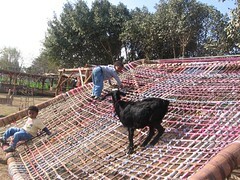 First, we enjoyed a picnic in their backyard, with the company of some goats and puppies. 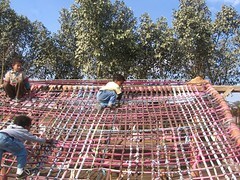 And the boys played on their free-form, woven playground. 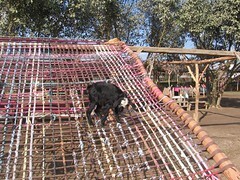 And so did the goat (who was trying to escape the very curious puppies). The boys were pretty much terrified of the goat. Eventually one of the goat tenders had to rescue the poor thing. Fagnoon’s setting is lovely. It’s surrounded by agricultural fields. 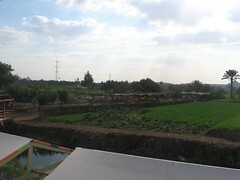 We don’t usually see all this green in Cairo. 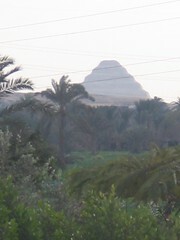 In the distance stands Sakkara, the Bent Pyramid. 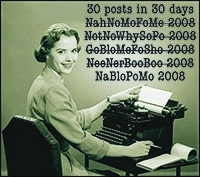 Meanwhile, back at Fagnoon, the boys each worked on two projects. The first was sand art, except with colorful sawdust left over from their wood projects. They also did some free form painting. 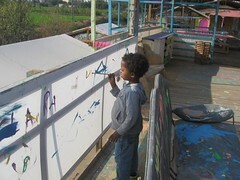 Here’s Giggle painting. Fagnoon was fantastic. Really one of the best places I’ve ever been for kids. And the boys had a great time. Fagnoon is such a fabulous place. We took students there on a field trip a few years back. Art is often undervalued in the curriculum of local schools, so it’s great to see them embrace it at a place like Fagnoon. i went to fagnoon sinec i year .it was atrip with the school .it ws wonder full.